Brooklynites author and freelance photographer Seth Kushner shot my portrait today, for his new project on New York City cartoonists. (man_size , purvision, dangoldman , zegas, bertozzi , and heartshapedkey are some of the previous subjects of Kushner’s lens.) Kudos to purvision for suggesting Seth shoot me in the context of a stoop sale (which—in honor of A.D.—I gave a strong New Orleans flavor). I don’t normally photograph well, but I love the way this image came out. I really dig Seth’s dramatic lighting and desaturated colors; believe it or not, this image was shot on a lovely sunny spring day. Anyway, click on the photo if you’d like to see a larger version. And thanks again, Seth! Damn! I missed your stoop sale AGAIN!! P.S. 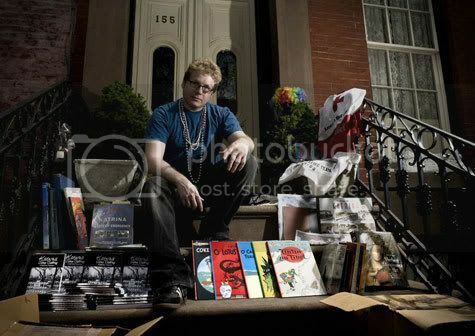 We’re having our annual stoop sale this time on Sat., May 31, at 241 Carroll St.
you are getting the reputation as the nation’s foremost expert on stoop sales! congrats on the celt’s manhandling of the king last night! I love this photo so much. Well, I love all of the photos that Seth does. Just beautiful. Damn, that’s just so you and so perfect. The casualness and calm of it instead of usually very excited and ominous feeling of Seth’s photos (which I also enjoy) gives it a great strength. I also looked through his other cartoonist photos. Good stuff! I esp liked Gabrielle Bell’s. He captured something of her intensity. She either has given birth or has a very good idea what it entails. Social customs being what they are, she’s probably cleaned more messes – done more laundry, more dishes, more toilets. ← Phoebe conquers grass phobia!! !